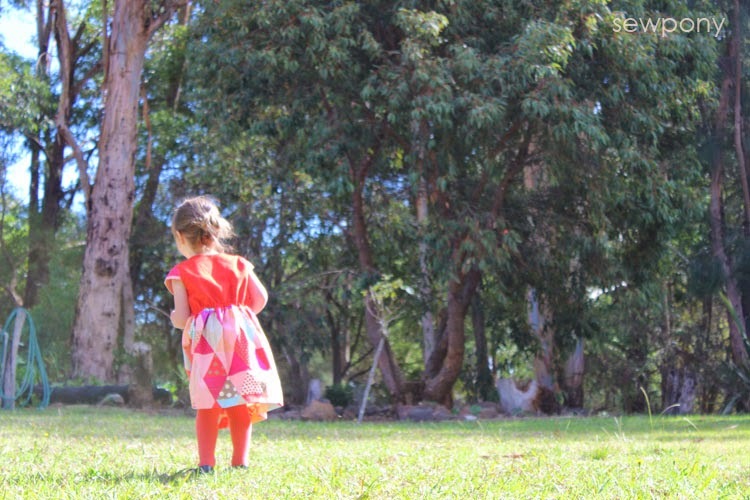 I have got a sewing bug at the moment and since it's Kids' Clothes Week, I started this dress yesterday for Emily and finished it today. It is not in keeping with the "Wild Things" theme of this season of KCW, but I can still share, right? 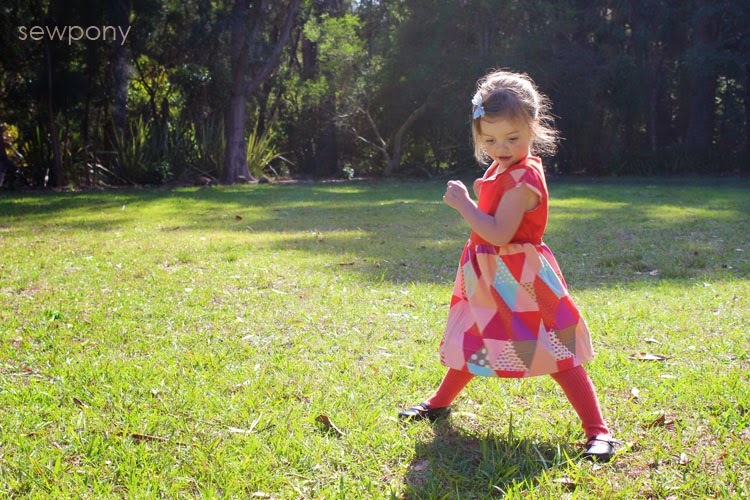 The pattern features a sweet suit style fold down collar, three different sleeve options (two capped, long sleeved), as well as sleeveless, and fully lined dress. I lined only the bodice since my fabrics are thick, however the pattern has an under skirt which peeks out the bottom of the dress. 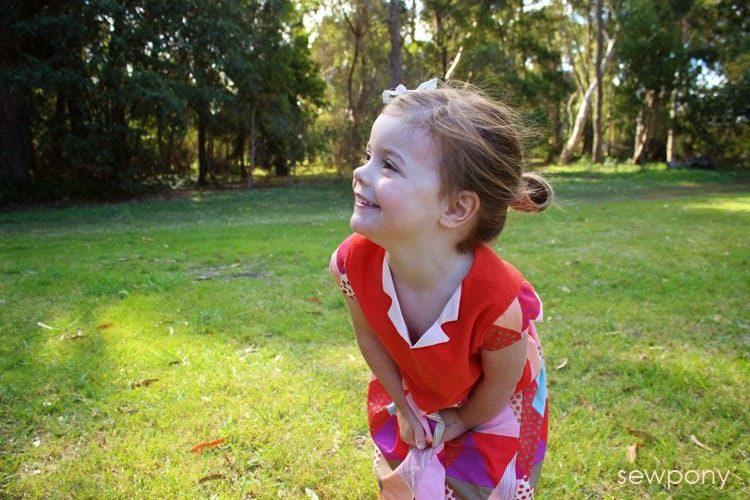 The back of the bodice is elasticated and the dress has no fasteners (for sizes 3-12). 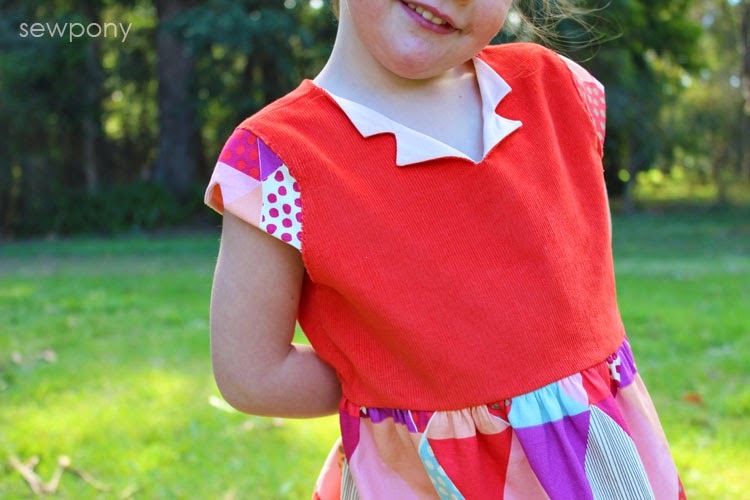 The fabrics I used were a lovely soft red corduroy I had in my stash from Spotlight, some pink cotton couture for the bodice lining (and turn over collar) and the skirt/sleeve print is by Koko Seki which was generously given to me from Frances from Miss Matatabi. This particularly print is not currently available in her shop, but look at all the other lovely ones! I had so much fun with Emily taking these photos. She has just come good after a bout of sickness that lasted about ten days. So nice to have my bubbly, funny and happy Emily back! 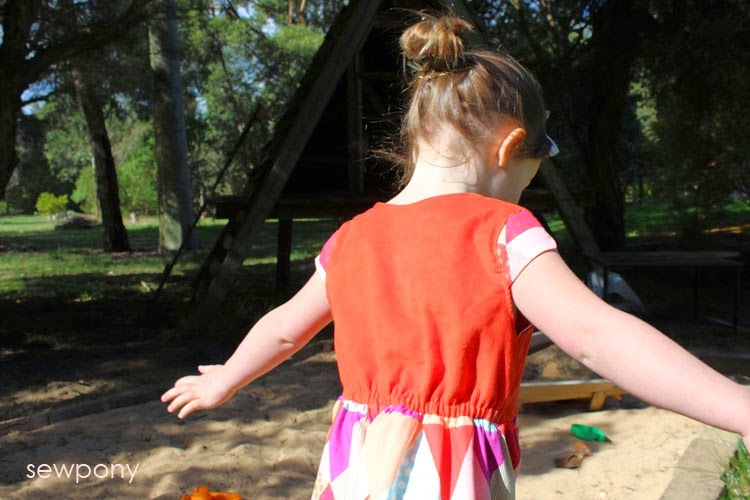 Below she is belting, "Let it go........" at the top of her lungs (hence the clenched arms! Let it go, let it go hehehe Emily is gorgeous, and boy does she look like her oldest sister!! Love the dress on her. Such fun colours. 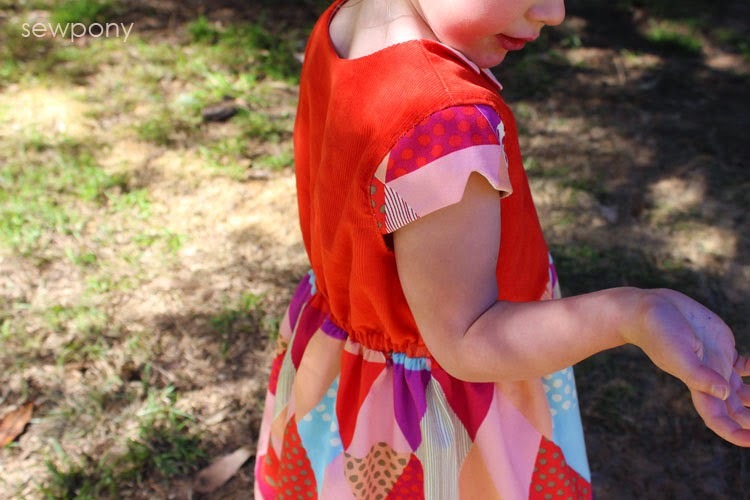 I also have this pattern and am planning on making this dress for R. Were you happy with how corduroy 'behaved' for this dress? 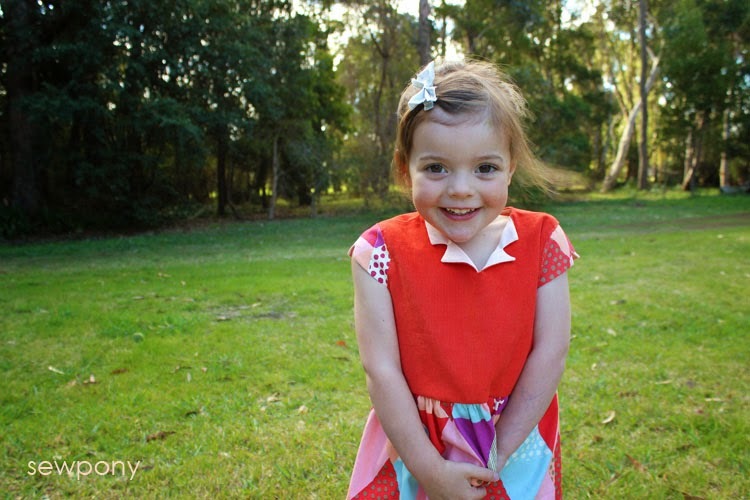 Wow, little Emily has been growing:) I love the gorgeous bright fabrics you've chosen Suz - so fun!! The dress and Emily are gorgeous! She looks such a big girl with her hair up! Aw, so cute! 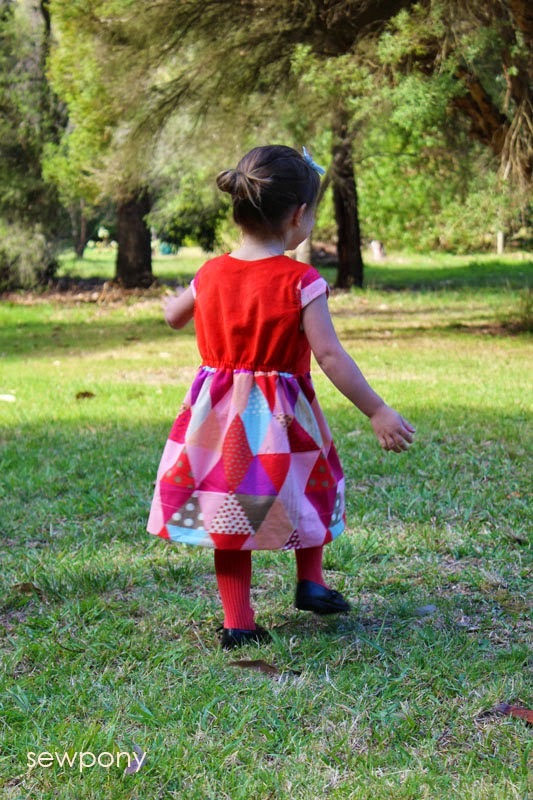 Thanks so much - I'm glad you were pleased with the pattern!